Fanny packs are back for a reason. They're just so handy! The fanny pack clips in the back and easily adjusts to make your bag fit just perfect. The colorful donut print simply zips up the top so it's super easy to keep your belongings safe and sound. So maybe you're putting together a chic DIY Simpsons costume. Or perhaps you're simply looking for a colorful way to keep your belongings on your body at all times. 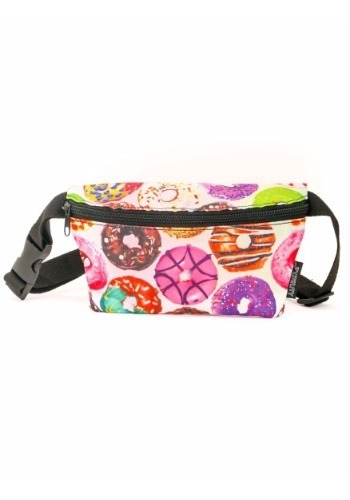 This fanny pack will keep up with your colorful music festival or donut tour ensemble. So buckle up, just like the actual treat, there's always an occasion for a donut fanny pack!